Hello, and welcome to JT Hughes Honda Shrewsbury. And today I'm going to be showing you around this Ford Kuga. So this Kuga's a Titanium X. It's a 1.5. And that's the petrol and an automatic. So this car is a 67-plate, so it's still in manufacturer's warranty. It has two keys, and of course, it's got the first stamp in there as well. So as you can see, this car is in immaculate condition. It's a very good spec. The Road Fund Licence on this car is £140 for the year, very good on MPG. We also offer a very good selection of used car finance. You can have that on PCP and HP. So the car has front and rear parking sensors. It's also got the rear parking camera. Okay, so inside, you've got full leather, heated seats, electric adjustments on the driving seat there. Like I said, it is the automatic, this car. You've also got sat nav, CD player, cruise control, Bluetooth. There's an awful lot on this car, so a very good spec, being the Titanium X. You've also got the panoramic glass roof. It is a sunroof, so it does open as well. Very good mileage as well on this car. And then, in the back of the car here, as you can see, full leather, again, throughout. Loads of space. 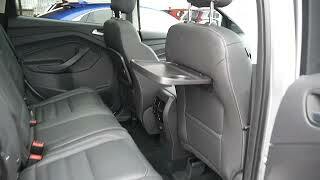 Got little tables there for your passengers. It is an all-wheel drive, as well. And of course, being a Titanium, you've got the electric tailgate, which is very handy if you're going shopping. And a very good size boot. I just close the tailgate, again, like I said, it's all electric. Okay, so if you want more information on this car, or like to come along for a test drive, why don' t you come along to our dealership here in Shrewsbury. We are on Battlefield Road. Thank you.